The Hotel Alexander is located in the heart of Stribro's historic center. This Stribro 4 star hotel is a perfect starting point for trips to West Bohemia's best attractions, such as the Tepla and Kladruby monasteries or the Pilsner brewery. 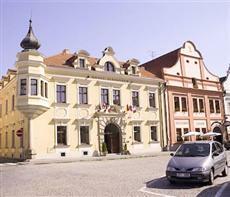 It is also in a convenient position for business trips, close to the Borska Pole industrial park near Plzen. This luxury hotel is housed in a beautiful historic burgher house, which dates back to the mid 13th Century. It was lovingly restored and converted into a hotel in April 2006. In fact, the present building retains many of the original characteristics of the medieval original and the 16th Century rebuild, such as the medieval floor plan; the renaissance facade with its corner bay windows and elegant turret; and finally the bombastic stone portal, dating back to 1585. Ideal for a rather special vacation in Bohemia, this historic hotel features a lounge bar and an free Internet Point so that you can keep an eye on your emails. You can enjoy light snacks and ice cream at the Garden Restaurant during the summer too.